IoT-Ignite is constructed to provide a platform to make IoT ideas come to life, from makers to industry size development groups. IoT-Ignite Developer Zone is targeting to increase service and product diversity by providing both technical and business model solutions for the developer. 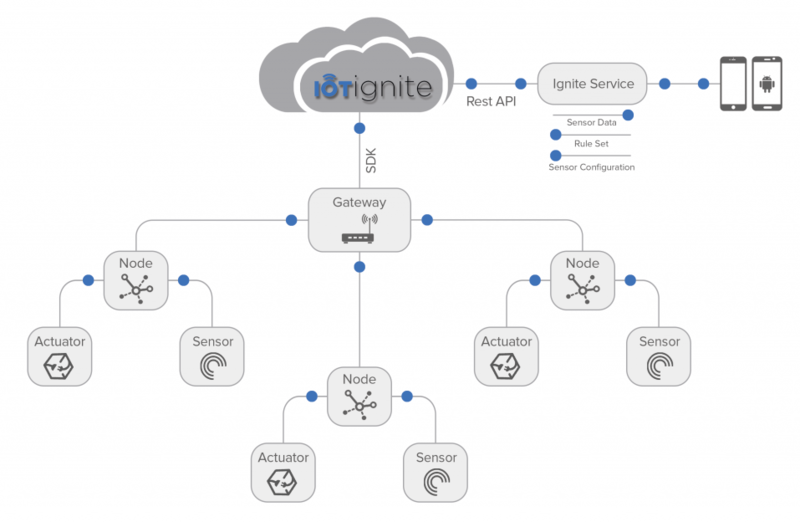 IoT-Ignite platform uses its own cloud. Each component of IoT platform communicates over multi-tenant structure. Devices on IoT-Ignite platform can be managed on both PilarOS and Linux OS. IoT-Ignite’s Android based enhanced mobile operating system with management APIs and IoT-Ignite Cloud access components. Device SDK of IoT-Ignite platform makes it possible for all devices to communicate with IoT-Ignite cloud, to transfer data, and all set of rules to be applicable on devices with IoT-Ignite Customer App. IoT-Ignite App undertakes programming task on the client side in IoT-Ignite platform. Server App is basically developed to share the data received over IoT-Ignite App with the end users. Ignite Service undertakes programming task during the data exchange of 3rd party applications with data send by Server (client) within IoT-Ignite platform. It also makes it possible to share all data and rule sets received from customer app over end user web and mobile applications.